The new Panamera Turbo S E-Hybrid sees Porsche launch a plug-in hybrid as a flagship model for the first time. The four-litre V8 engine from the Panamera Turbo is combined with an electric motor, resulting in 680 hp of system power and 850 Nm of torque. That means it accelerates from 0-62mph in 3.4 seconds on its way to a top speed of 193mph, while the 'boost strategy' of the all-wheel drive Panamera comes from the 918 Spyder supercar. The new model can drive on fully electric power for up to 31 miles. A decoupler installed in the Porsche hybrid module is actuated electromechanically by an electric clutch actuator (ECA), like in the Panamera 4 E-Hybrid. The result is short response times and a ‘high level of comfort’. As in all other second-generation Panamera models, the fast-shifting Porsche Doppelkupplung (PDK) with eight gears is used to transmit the power to the standard adaptive all-wheel drive system Porsche Traction Management (PTM). The Panamera Turbo S E-Hybrid comes with air suspension as standard and offers a ‘unique balance’ in this segment says Porsche, combining the comfort of a luxury saloon paired with ‘sportscar-level’ performance. The electric motor is supplied with power via a liquid-cooled lithium-ion battery with an energy capacity of 14.1 kWh. Within six hours, the high-voltage battery integrated in the rear is fully charged with 10 A via a 230-V connection. 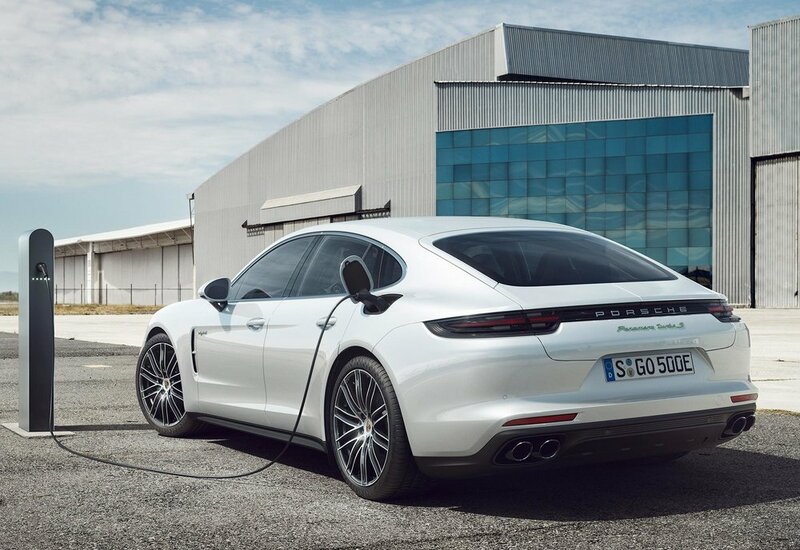 If the Panamera uses the optional 7.2-kW on-board charger and a 230-V connection with 32 A instead of the standard 3.6-kW charger, the battery is fully charged in just 2.4 hours. The charging process can also be started using a timer via Porsche Communication Management (PCM) or the Porsche Connect app (for smartphones and Apple Watch). An auxiliary air conditioning can also cool or heat the passenger compartment, even during charging. The Panamera Turbo S E-Hybrid starts in the purely electric “E-Power” mode as standard. When a specific pressure point is passed in the accelerator pedal, or when the battery charge level drops below a minimum value, the Panamera switches to “Hybrid Auto” mode, at which point the power of both engines is available. Consumption in the New European Driving Cycle (NEDC) for plug-in hybrid models amounts to 97.4mpg for super-grade petrol (66 g/km of CO2). The new flagship Panamera will go on sale in the European market in July 2017. From launch, the four-door Gran Turismo will also be offered in an Executive version, with a wheelbase extended by 150mm. As part of its standard equipment, the Panamera Turbo S E-Hybrid includes the Porsche Ceramic Composite Brake (PCCB), Porsche Dynamic Chassis Control Sport (PDCC Sport) including Porsche Torque Vectoring Plus (PTV Plus), Power Steering Plus and 21-inch alloy wheels in the 911 Turbo Design. The basic package also contains auxiliary air-conditioning, adaptive aerodynamic elements and three-chamber air suspension including Porsche Active Suspension Management (PASM). The long version is equipped with rear axle steering as standard.